I’m restoring a “73” cj6. Bid is up to $520. so far. They are eBay item #271231323130. Sorry Mike … I’d posted the wrong ebay item number on this. These sold for $520 after 18 bids earlier today. Mike – where are you from? I have 12 of these, and I can sell a few off if you’re interested. I need a set of the kelsey Hayes 8″ wheels. If anyone knows where I can find some, it would be much appreciated. I have 4 of the Kelsey Hayes Renegade 1 wheels, if you are interested. They are in good shape and have been powdercoated black, but can be painted any color. Let me know if you are interested. Yes i am interested. A photo and your sale price would be helpful. You can reach me via my website robinpriestley.com I have no idea how to send a private message. I believe I have four of these wheels at my place in Wickenburg, AZ. They came off a 54 Jeep. I might be selling them, as they don’t fit over my front 11″ brakes. I still have my set. If you are interested I can email you pics and any other info. Dennis, I still have my set and I’m willing to sell them. Hello Matt Haynes, I’m looking for a set of Kelsey Hayes wheels. Are yours still available? Oh my goodness! Now Ewillys finds me! Missing for over a year. To be fair, Matthew Goode has to have first shot. If it doesn’t work out Matt Haynes, please let me know. I’m not sure why you didn’t get anything earlier. Sorry about that! I would also check with Chris McKay at nscustoms@hotmail.com. He could very well have a couple. He’s a great and fair guy who knows those rims well and will even keep a look out for you if he doesn’t have them. Good to hear Matt! My email address is matthew89goode@yahoo.com so we can discuss details. Thank you. I have two sets (8 wheels). One set still has the tires on. 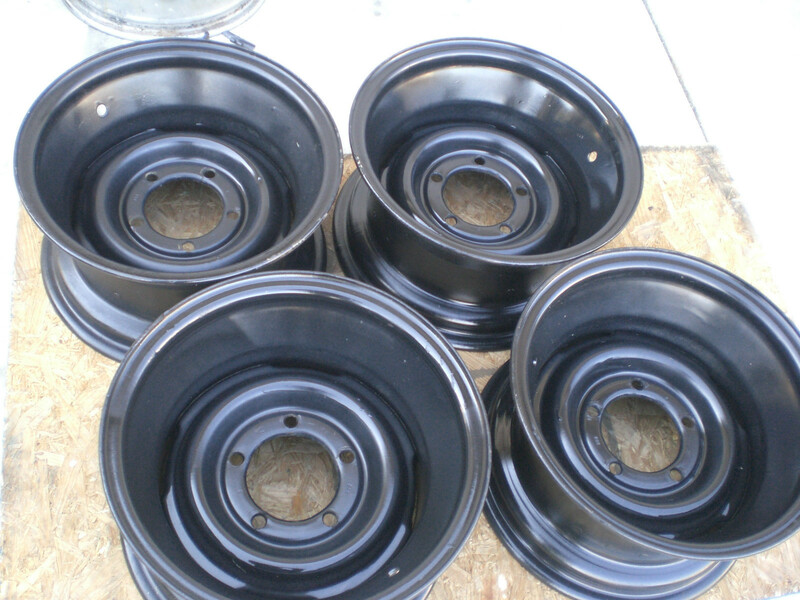 The other were recently sand (aluminum oxide) blasted and primed. Matt replied to the email rather than adding it here (no worries Matt). He indicated his rims have sold. I am in search of one OR two of these wheels KH- 79005 15X8. I realize this is a fairly old thread,so my apologies for resurrecting it, but what are the chances that any of you still have a set of these? If anyone does,please contact me. Text or email works best initially. Nothing wrong with resurrecting an old post. I haven’t seen any of these rims around lately, but you never know when they’ll pop up! Mine are all long gone. Anyone who emailed or called me is on a list if I get more. Somebody could reproduce these and sell a million of them ….